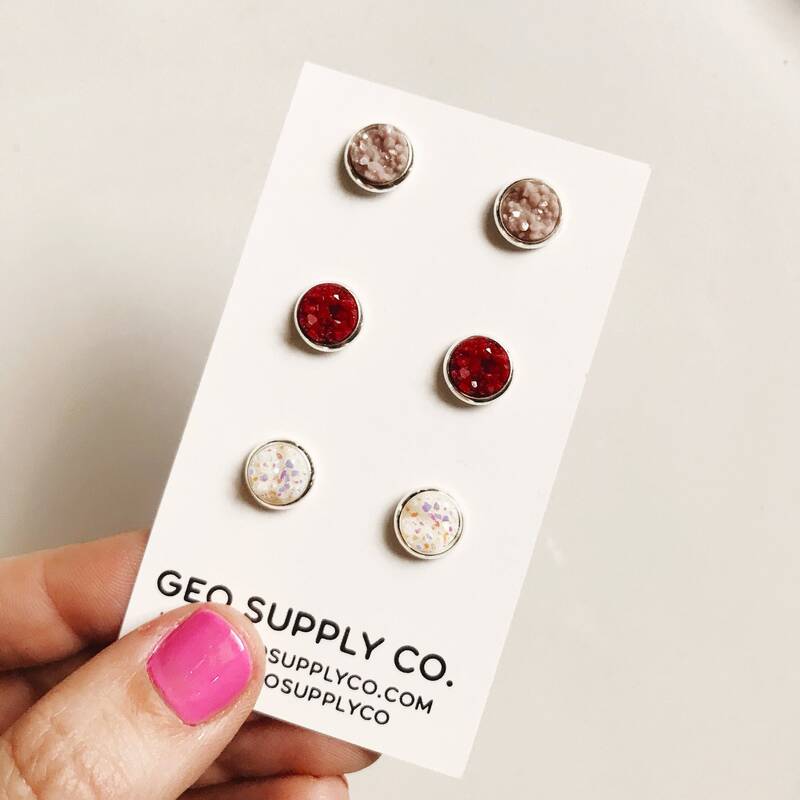 Trio Faux Druzy Earrings // 3 Pairs for the Price of 2 Pairs // Setting Druzy Earrings // Druzy Stud Earrings // Geo Supply Co.
GALENTINE EVENT! At The Gemma Shop in Westerville. Saturday 2/9 from 12-3pm. Free necklace customization, bubbly, and great shopping! 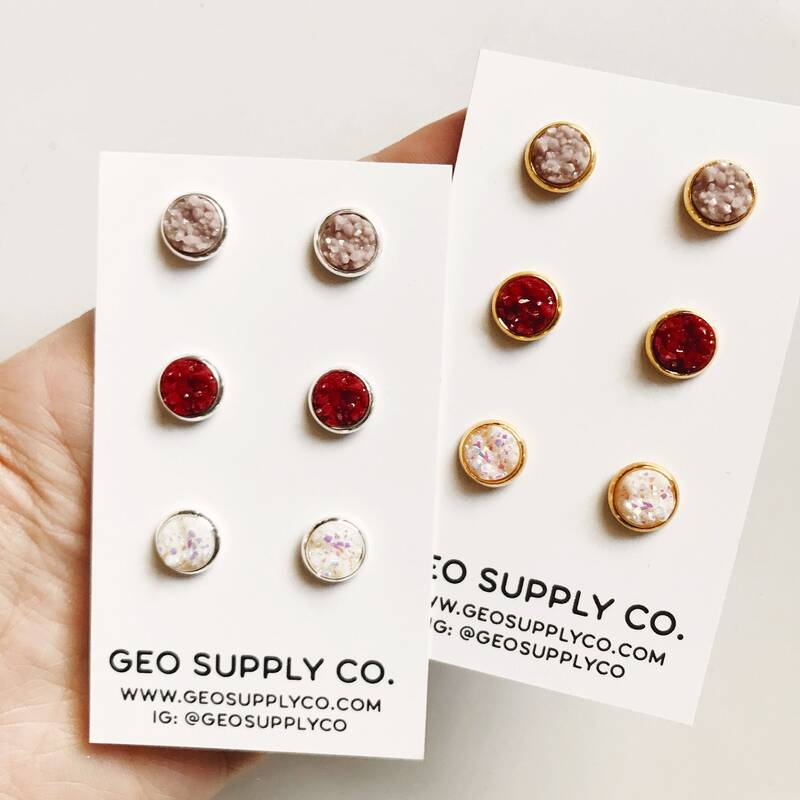 The Faux Druzy Earrings are made of acrylic and plated-posts. 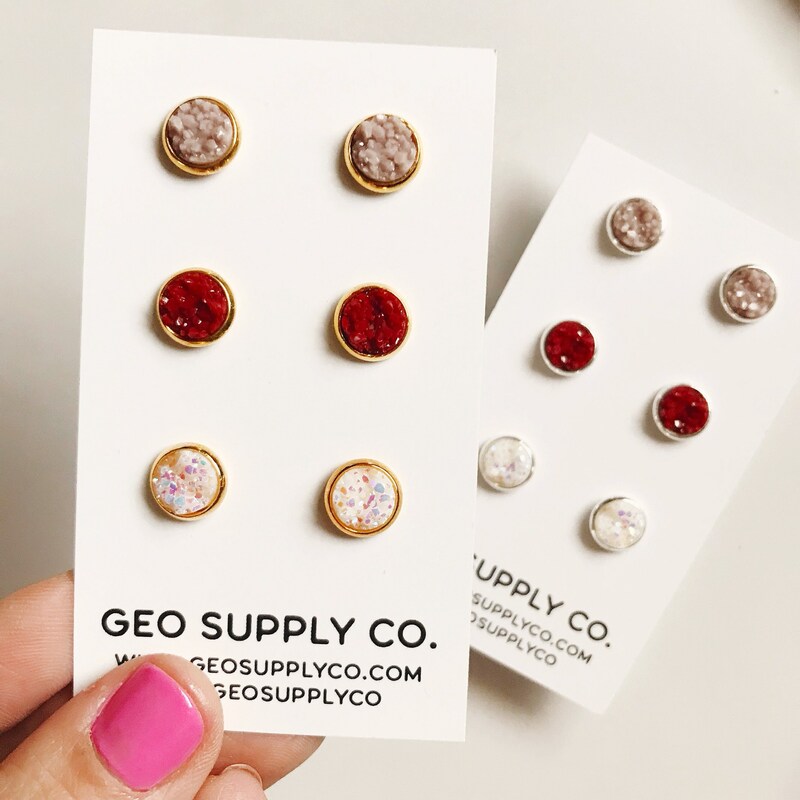 NOTE: these are NOT real druzy stones! They are acrylic with metallic paint. The stone is 8mm wide. 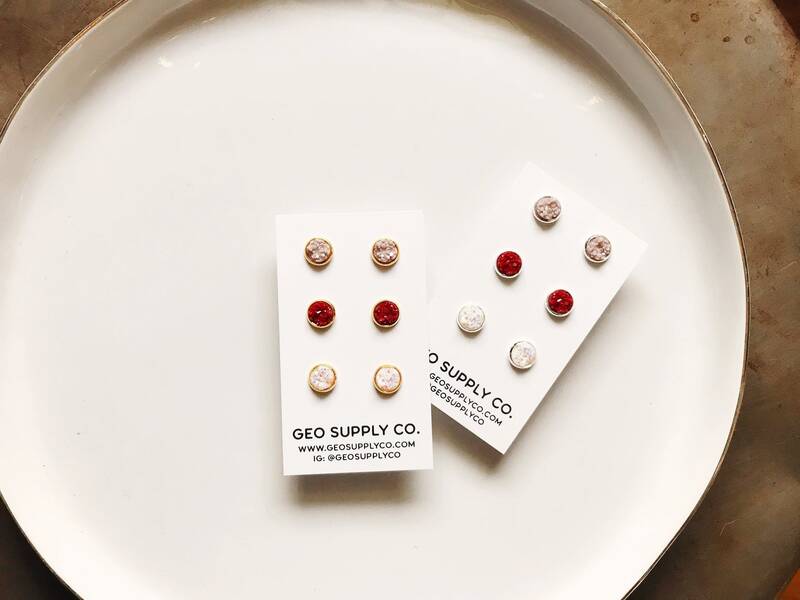 With this listing you get THREE PAIRS in dusty rose, rose red, and opal white. Choose between gold or silver setting! Payments are made through paypal or direct check out with a debit or credit card. It is wise to make sure both your Etsy and Paypal addresses match up and are up to date before checking out. I want to make sure your order reaches its destination! 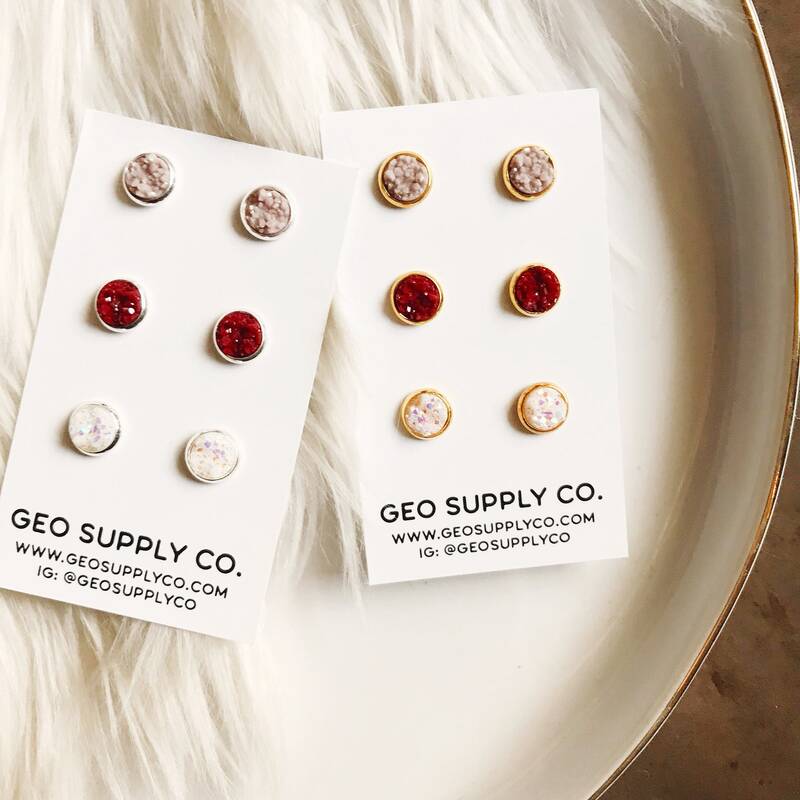 If you are shipping to a different address or to a gift recipient, you may edit your address during checkout so the recipient's address is in the invoice. I ship via USPS first class mail. Once the shipping label is printed, you will receive an email notifying you of the shipment with the tracking number included. IMPORTANT: I am not financially responsible for any lost or stolen packages. Once the package has been handed over to the USPS, I am unable to control how long it takes to get to you or if it is lost. I cannot refund lost packages/orders. At this time, I do not ship internationally. My current turnaround from ordering to being shipped, as stated in my shop policies, is 12-14 days. You will receive an email notification when it has shipped. Most jewelry items are not refundable as they are custom made and personalized solely for you. This includes personalized items/or any item that I have somehow altered to your specifications. For non-customized pieces please message me. I do not exchange chain lengths, so please be sure to select the correct length. Measure a necklace or bracelet you have already as a way to test out lengths you like. If your chain or earrings break, message me immediately. If for any reason a necklace is returned to me to be fixed, please note that you will need to cover the shipping costs. All orders canceled will be subject to a $3 processing charge. For the stamped jewelry, can you stamp on both sides? I cannot stamp on both sides because some of the impression will show through. Do you give discounts for bulk purchases? Yes, for 6 necklaces or more I offer a 20% off discount. Send me a message before ordering your necklaces and I'll give you the special 20% off code. Where do I leave my custom details for my order? 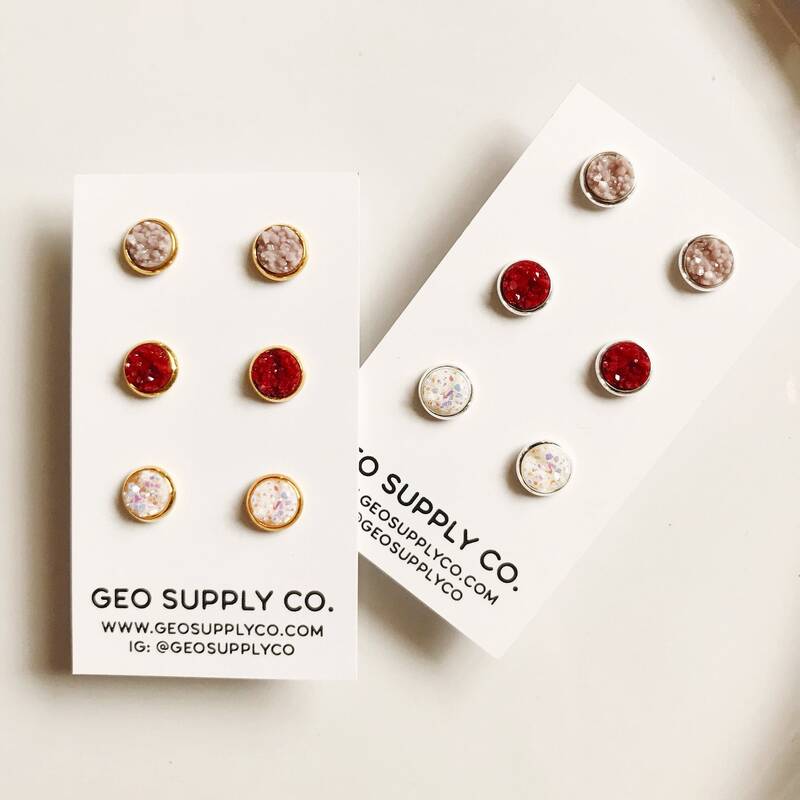 When you check out, there will be an empty box that says "note to geosupplyco" and you will leave your information there. Be specific - the more details the better! To help prevent tarnishing store your piece in a clean, dry anti-tarnish bag similar to the one provided. Do not wear your jewelry in the shower, hot tub, or swimming pool. Humidity can speed up the oxidation process that causes tarnish. Minimize jewelry contact to chemicals such as lotions, hairspray, and perfume. How do you clean raw brass? There are several tips on cleaning raw brass. I found this article (http://jewelrymakingjournal.com/how-to-clean-brass/) to be most helpful! 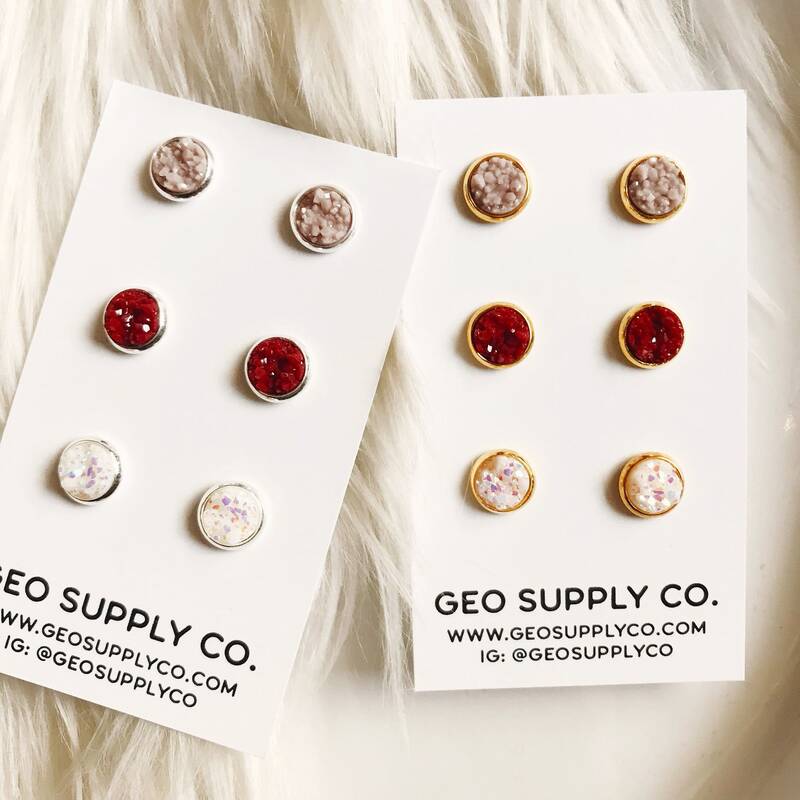 © 2019 Geo Supply Co..